Mawaru Penguin Drum 01 – Hell Yes! Penguins? Yep, we got that. My first impression of Mawaru Penguin Drum is absolute love at first site. I haven’t been happier about a first episode in years. If, somehow, the rest of the series turns out as well as this first episode, I can see it challenging Haibane Renmei for the #1 spot on my all-time favorites list of anime. Let me stress that I don’t allow shows privileged spots easily. I only have four shows on my Top Ten list of anime for a reason; excellence isn’t good enough. 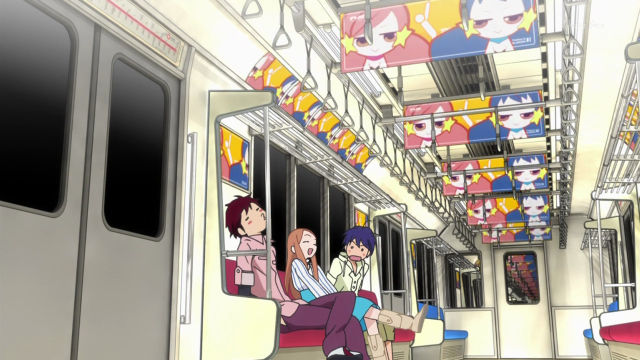 Can I be certain that PenguinDrum will blast past all of the legitimate masterpieces that I have refused a spot on my Top Ten list? No, not from one episode, but I am certainly looking forward to watching how it turns out to see whether it can do so in the end. Doctors aren't gods you know. 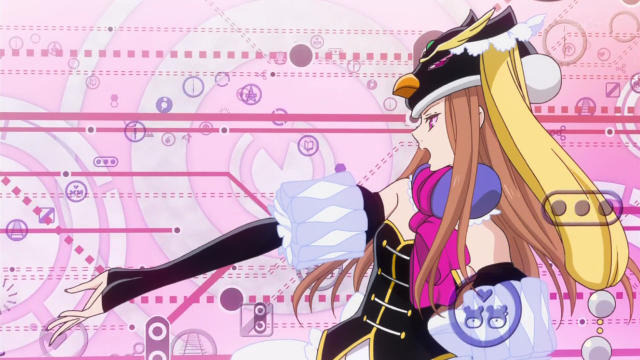 So, with all of the mystery that surrounded PenguinDrum, what is it, really? We still don’t know. Oh, we can say a lot more. Start with two brothers, and a dead sister, add in some helpful penguins… Get the idea? A dark family tragedy combined with magical comedy, or is it philosophical Science Fiction with a hint of forbidden Romance? 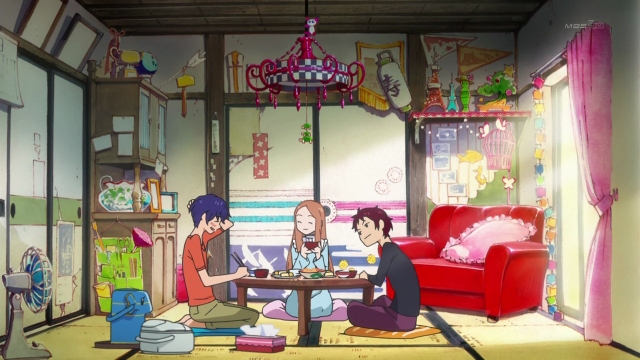 PenguinDrum seems to re-invent itself from moment to moment. 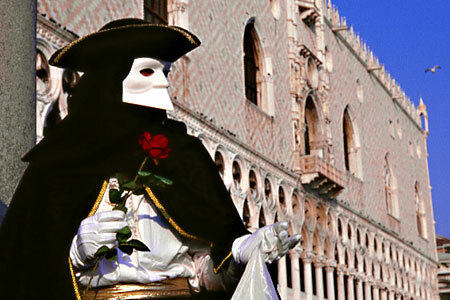 When I was in my 20s, I travelled to Venice, Italy to see Carnevale. Venice itself is a true marvel, but wandering around aimlessly during Carnevale was a surreal experience, because before turning the corner I could never know what I was about to see, even if I thought I had come this way before. 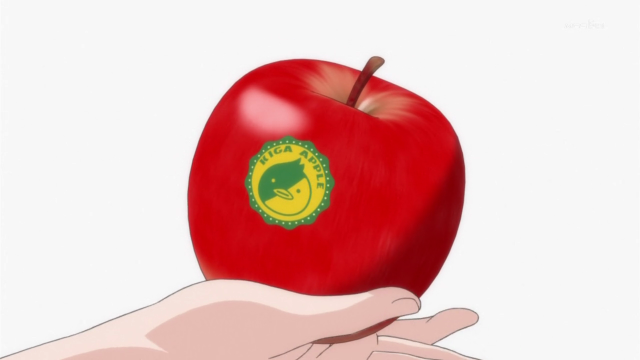 The apple is the Universe itself! A universe in the palm of your hand. It’s what connects this world to the other world. The apple is also a reward for those who have chosen Love over everything else. The Takakura family is the focus of the series, at least so far. The parents are both presumably dead (one shot of the name plate in front of their home, shows two names covered over). As one can see from the above screen shot, and the next two that follow, their home is filled with fascinating details. This show is FILLED with things to look at. This kitchen is a work of art, so rich in detail. Everything looks so good, it is almost difficult to talk about anything else. 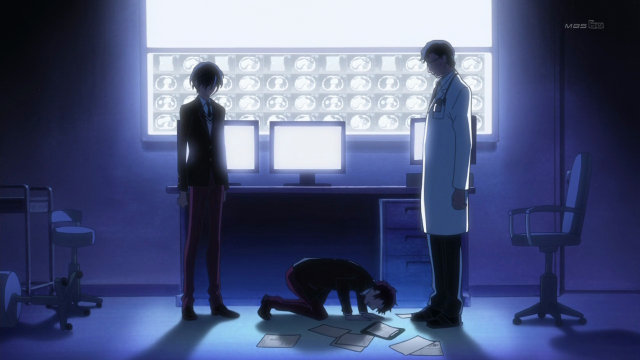 But there are other things to talk about, for example the fragile relationship between the brothers that (at least momentarily) crumbles when their sister, Himari, died. In fact, several times throughout the episode the brothers compete in one way or another for their sister’s praise or attention. Exactly how the brothers relate to each other, and how their relationship develops, will be interesting to watch over the course of the series. This was a fascinating scene because of the way the monitors were animated. Wow. Shou is about to enter the Shinjuku subway station. There is a LOT of imagery related to the subway. Why? I don’t know, but there it is. The characters ride on subways, both real and metaphorical. The signs for the subways stations zip around. 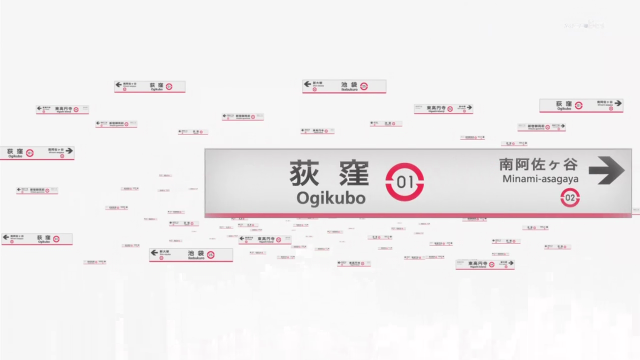 The title-card mimics a subway line map. 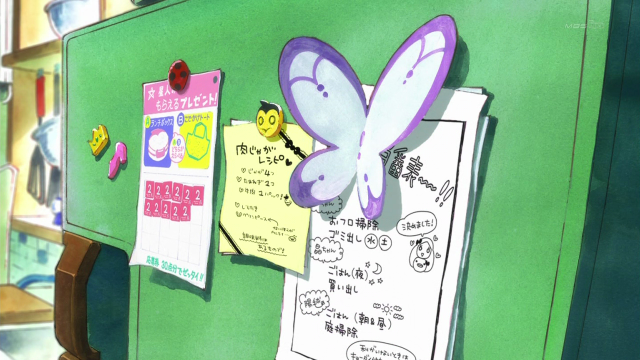 At one point we see Shou’s subway pass. 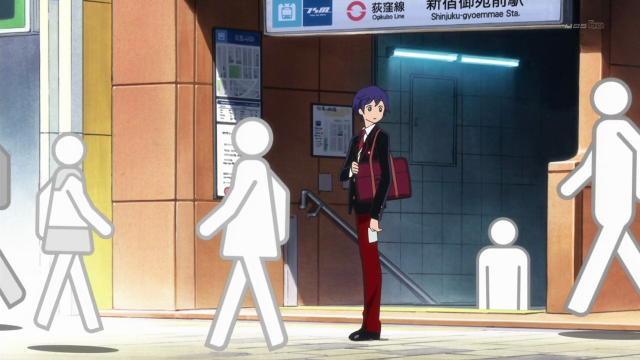 Finally note that in the scene, shown above, where Shou stands in front of the Shinjuku station, the “extras”, or people walking past him, are represented with graphics that are reminiscent of the AIGA pedestrian symbols, intended as international symbols to aid communication in transportation centers. I loved this episode so much that I could go on and on, but there is one more thing I feel I must REALLY talk about. 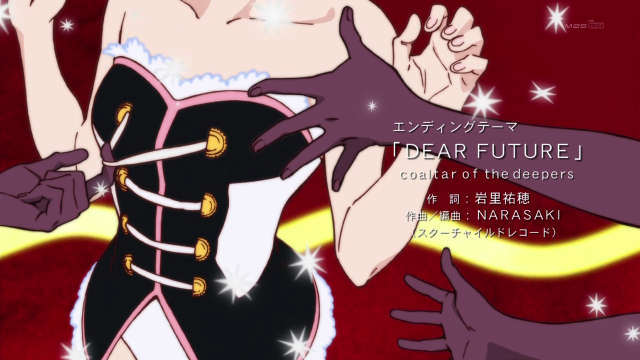 I recognize that uniform ... Utena! With Kunihiko Ikuhara at the helm, there were many wondering if this could be another series as cool as Revolutionary Girl Utena. It certainly has some similar stylistic touches, and out-right references. Some themes may even be back, but this episode denied the audience a full explanation of what lies ahead of us. The Absolute Destiny, Apocalypse? A war against an unjust God? Or just a simple fairy tale? The prince wrapped the princess in a rose-scented embrace, and gently wiped the tears from her eyes. Well, IMO, this first episode was excellent. 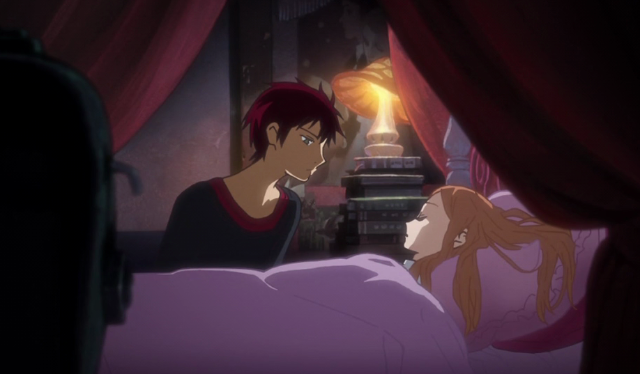 I can’t wait to see if PenguinDrum continues to deliver on this level. UPDATE: There has been a LOT of good commentary on the first episode. Here is one thought-provoking essay that breaks down the symbolism of this first episode. All this positive feedback for Penguin. I wasn’t planning on watching the series (I have no idea what Utena even is), but I guess I’ll have to give it a shot. As much out of curiosity as out of the good reviews. I was completely blindsided by this episode, wasn’t even aware who was directing it. It was a nice surprise to see how good it was. I am however, still 3/4 through Utena at the moment and should really get around to finishing Star Driver. Blindsided can be good. Make sure to finish up Utena, because it is a good show. Oh this would’ve been love at first sight to me as well if only I saw more of the humans than the penguins, haha! I almost thought the penguins are the main protagonists in it. 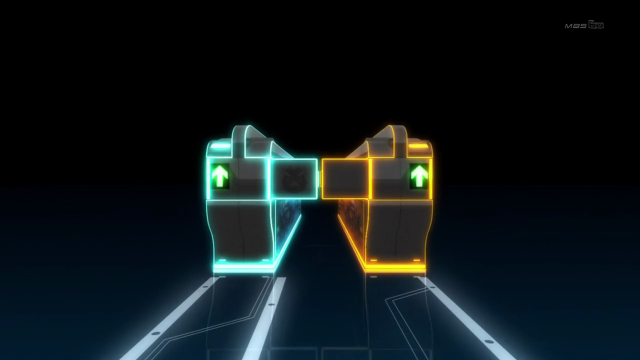 = So that’s why the graphics seemed familiar…. COOL! They’re not just penguins, they’re SUPER-penguins. At least they are better at knitting than most penguins. Also, Yes! keep us guessing. There is another show with similar walking figures all over the place, I can’t remember now. Actually, your screencaps remind me of Okama’s work, now that I look at them. But how come penguins are so popular in show biz? They’re huge!! Animated movies, cartoons, Jim Carrey’s something or other. It’s getting ridiculous. I don’t know about the penguins. I thought it was pretty out of the blue when a character declares he wants to be reborn as a penguin in Kore wa Zombie, but you are right, when you start looking for them they are everywhere. Regarding Okama, I think I see what you are talking about (sample). I agree, this was a great first episode. It’s been a while that an anime has made me feel like we could have a genuine classic on our hands, and I am really excited to see more. 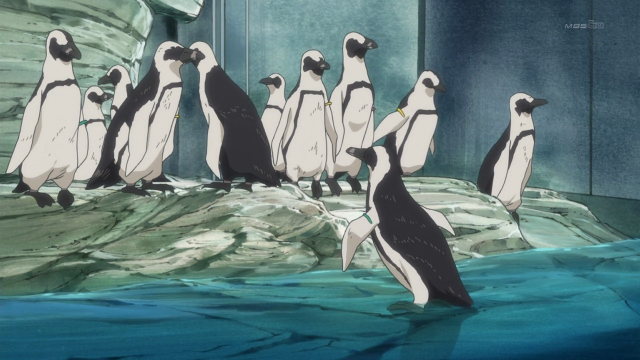 There’s so much going on visually and symbolically this episode like you said, and there are plenty of unanswered questions right now, but I’m most curious about what the penguins are. The penguins at the aquarium seemed almost exaggeratedly realistic while the siblings’ penguins are much more simply drawn and cartoonish, so there’s clearly something different about them besides what we already know. I don’t know if they’re benevolent or not, but they seem supernatural and it’s strongly hinted that they serve whatever brought Himari back, so I hope we learn more about them soon. Yes, that is a good point about the contrast between the zoo penguins, which were so realistically represented, and the ?? I don’t know what to call them. Every scene in which the penguins appeared (after the defrost) had me literally laughing out loud, because of the juxtaposition of the ridiculous (impossible) with the low-key. I just don’t know what to think about this show, except that it will be fun finding out where it wants to take us. 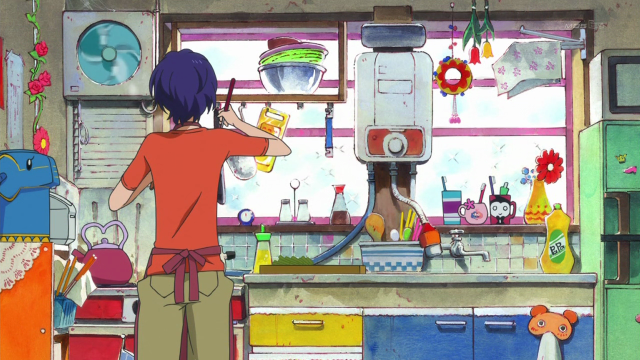 I posted a comparison between the Usagi Drop Kitchen scene and the one from this anime. I think it really highlights just how much energy is put into every setting in Mawaru. Man this anime loves the color.